~3-4 month supply. 0.6 oz. #1 Pure ACETYL HEXAPEPTIDE-3 (AH-3) - helps reduce the look of fine lines and wrinkles from repeated facial movements (a main cause of facial wrinkles) without the loss of facial expression. Safe alternative to injectible in-office wrinkle relaxers and fillers. Must use twice a day for maximum results. Morning and night. After VITAPURE Serum, apply thin layer on crow’s feet area; between the eyes and on forehead lines; on lines around the mouth. Let dry. May feel a tightening / tingling sensation and brief redness may occur. When fully absorbed, follow with L’ATHENE Moisture Treatment. IF YOU USE BOTOX®: Use WRINKLE TREATMENT as instructed. IMPORTANT: This product is a treatment product and is NOT a moisturizer and does not take the place of a L’ATHENE Moisturizer. 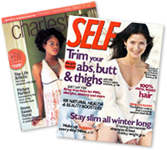 Charleston Magazine says about INTENSIVE WRINKLE TREATMENT: "Needles need not be the only way to get rid of wrinkles. 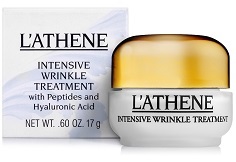 L'ATHENE Wrinkle Treatment helps." You may feel a tightening/tingling sensation. Brief pinkness may occur. Results can be seen quickly and are visible within two weeks. Best for skin that has begun to lose its natural elasticity. For targeted 'facial expression' areas: crow's feet, above and below the eyes, between the eyes, forehead lines, and lines around the mouth. Does this replace the benefits of my other L'ATHENE products? No. Other L'ATHENE products, such as SR-3 Daily Skin Rejuvenation System and NUTRIAGE Eye Repair Creme, are for antioxidant protection, hydration, firming, sun damage and skin toning. INTENSIVE WRINKLE TREATMENT is a specialized treatment for the lines induced by repeated facial movement to boost smoothing of facial line depth. Can you use this product with supplement dermatologic wrinkle treatments? It is always advisable to check with your physician. INTENSIVE WRINKLE TREATMENT is a great option to help lessen the look of lines and wrinkles. This anti-aging topical is powerful combination of two of the hottest anti-aging ingredients on the market. Clinically proven naturally-derived Argireline®/AH-3 Peptide intensely smoothes skin in the areas of repeated facial movement without loss of expression. Hyaluronic Acid promotes volume, plumping and ultimately gives a smoothing and firming effect. Vitamin C is known to stimulate collagen production. Helps prevent premature aging. How do I use MINERAL DERMA-SCRUB, the Microdermabrasion At-Home product, along with INTENSIVE WRINKLE TREATMENT? Once you complete your MINERAL DERMA-SCRUB treatment, you would apply VITAPURE Nutrient Serum, then massage INTENSIVE WRINKLE TREATMENT to the targeted 'facial expression areas' and let absorb. Follow with L'ATHENE Moisturizer.